So here’s the scoop. I am not one of those bloggers who takes amazing pix of beautifully perfect FO’s. You know, the lovely blogs we all look at for inspiration..things that remind us why we love knitting so much. 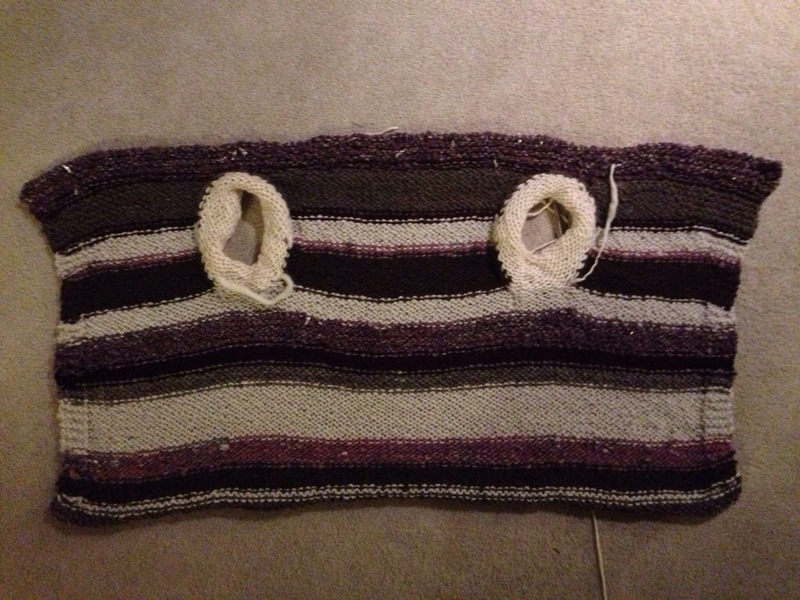 Nope, mine’s the real life, dropped stitch, “oops that seemed like a good idea at the time” sort of blog. This is one if those real life moments. I have been so excited about this sweater! It’s all been planned in my head, I wove in the ends as I went along, I even told my husband in a quiet, confident whisper..this could be the coolest thing I have ever made. I had to knit the start of the sleeves to see how it would fall on my body. Then I tried it on. Oh. My. Gosh. Not enough words or awkward pauses to say how yucky it was looking!! I put it down for two days..but not away. Away means “to the place of objects that will never get finished but I can’t throw it out.” No, “away” is not good. I put it on the floor this morning. Determined. 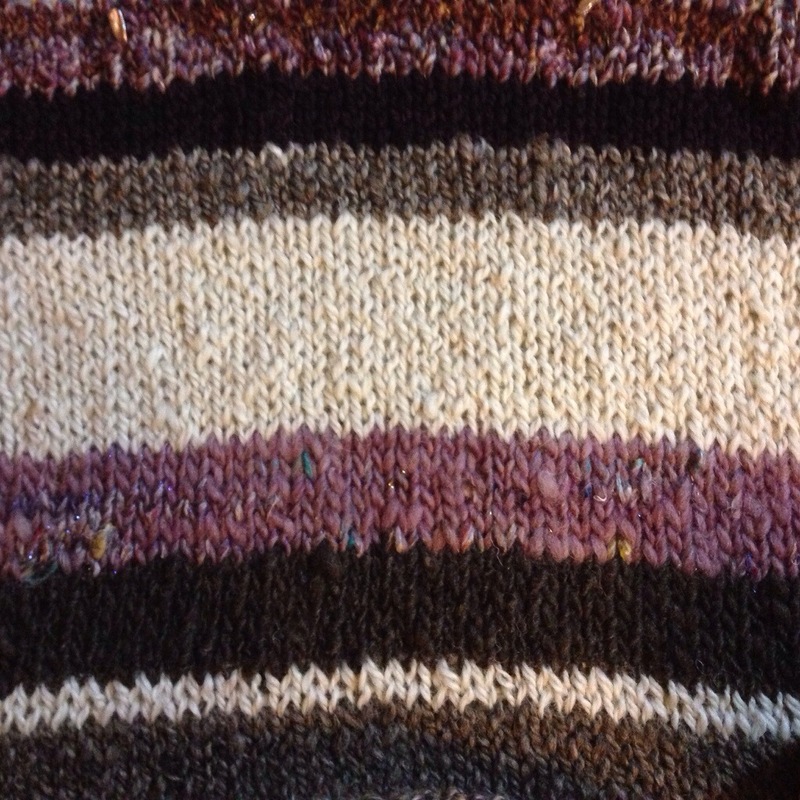 I frogged the top, down to the sleeves, did a three needle bind off for the shoulders and started an arm. There’s hope..I tried it on and the fit was soooo muchhhh better. I think it has been saved, but now I will need to add a collar. Once I finish the sleeves, I will post it and ask for collar ideas. But here’s where we stand now..and imagine that it’s blocked. So yeah..welcome to my world of trial and error! And thanks for the mojo! Send me some knitting mojo! 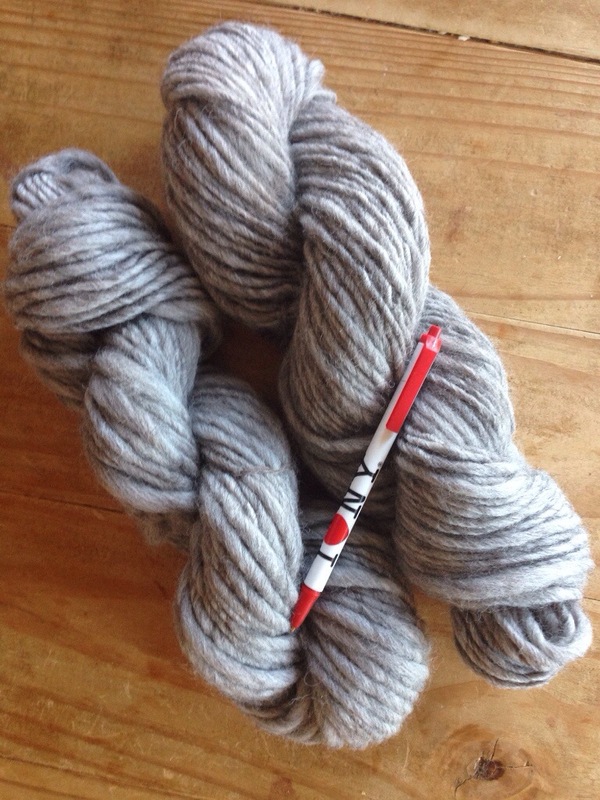 A while back I posted that I wanted to make a sweater out of handspun, preferably out of wool that I have processed. I’ve done a vest that way, but somehow a sweater seemed daunting. Then I had a serious “aha” moment. I was focusing on spinning just one type of yarn for a sweater, and I realized that I have lots of single skeins from one-off spinning moments and experiments. And.. I had enough of one similar color family to go for it. 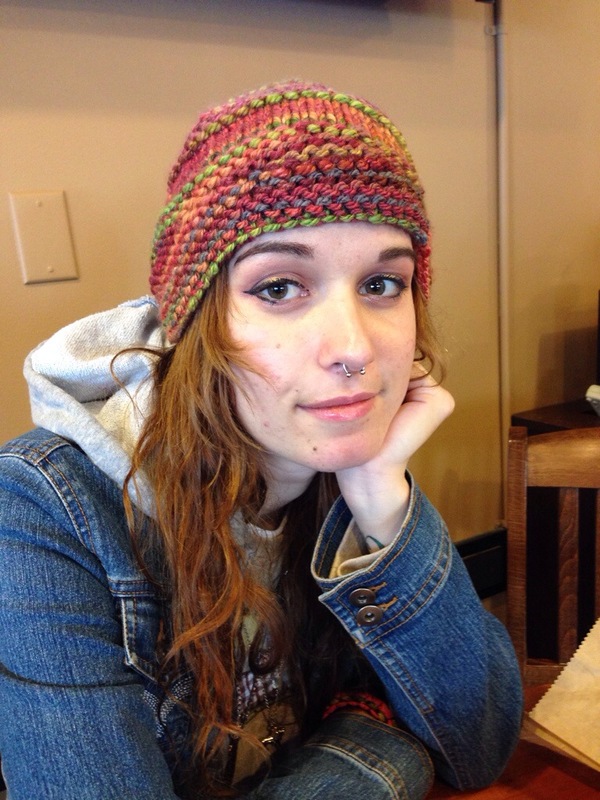 Then I decided I wanted a simple, free form, artsy fartsy make it up as you go sweater. 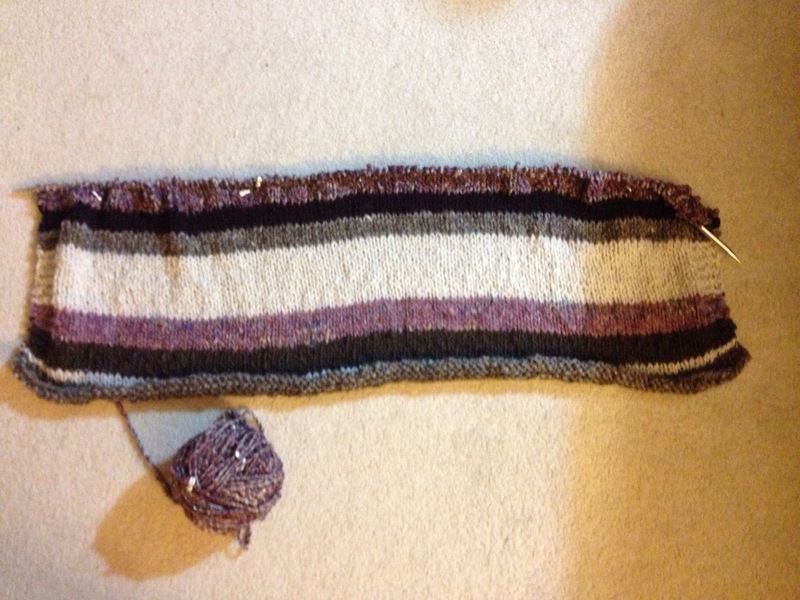 So I did a gauge swatch with size 13 needles to get a good drape (all the yarns are approximately Aran weight) and cast on! 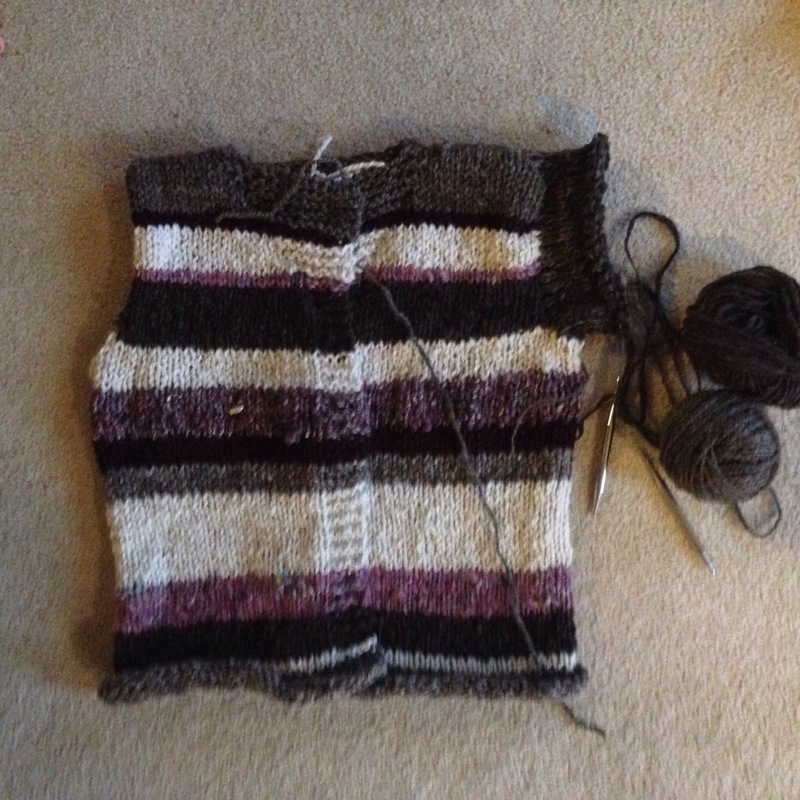 I’m making a rectangle cardi. I’ll split for sleeves soon, then finishing off the back and sides, and do the sleeves as drop shoulder in natural cream colored yarn. 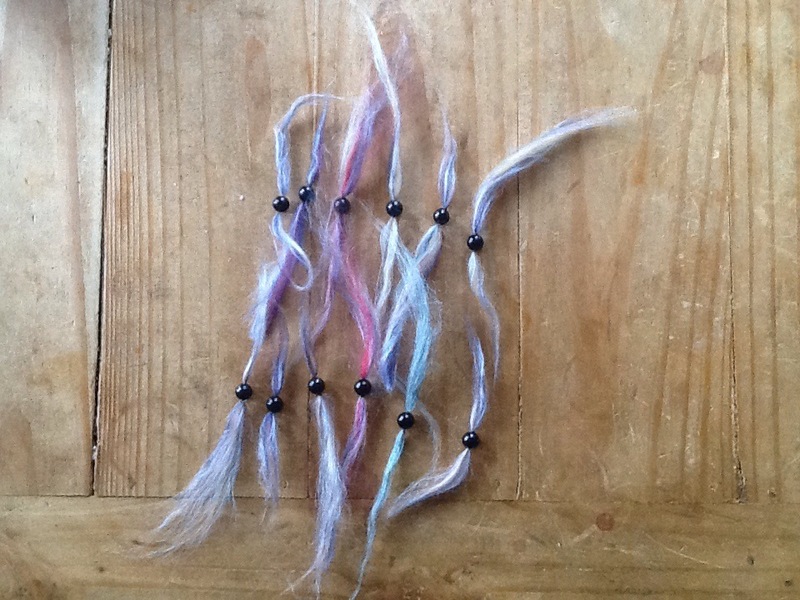 I processed and spun all of the yarns from raw fleece (except the one at the top of the pic with the shell beads spun in-I bought that roving and spun the beads in) and added sari silk and sparkle into the light purple one on the bottom. So I’m thinking I can crank out the rest of the back this weekend. Can ya send me some love? A full cardi like this will be a major milestone for me!! Happy Friday and Spin On! 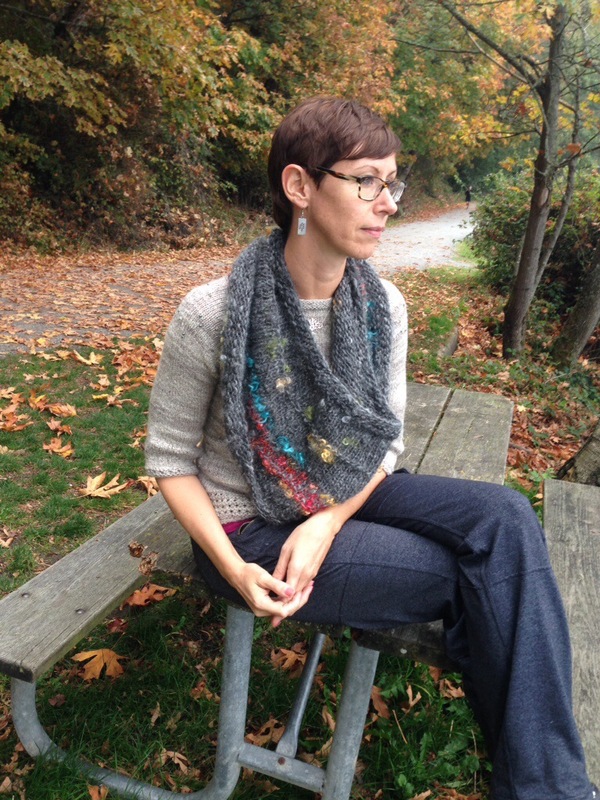 Recently, Christina from Feel Good Knitting wrote a great post about something we all go through as artists…inspiration. Which inspired me to think through that process a bit more. For me, 80% of my inspiration comes from being outdoors. When I get too wrapped up in color wheels and techniques, I find freedom in watching how all the “rules” are out the window when it comes to beauty in nature. Random color schemes, uneven light and dark, diagonals mixed with solids..I feel completely free when I take in that kind of beauty. But as we all know..freeform creativity does have an element of structure, but finding the balance between unplanned and something you would actually wear is a little trickier! So…here’s a little inspiration sharing from my top five “go to’s” if I am looking for inspiration and ideas. There’s many more, but my hope is that you will share a link or two below as well. Here we go! Pre #1. All of the blogs on my reader list, which is pretty much the same as my followers. I LOVE scanning my reader list and seeing what all of you are doing! 2. Quince and Company Blog I go here when I just want to be captured by an updated version of classic beauty. Their wool is locally sourced from the US, and the colors and textures are just awesome. 3. Do Stuff! Lee Meredith (Leethal Knits) I intentionally linked to her recycled reconstructed sweater because it’s a perfect example of how brilliant and unique she is in her creative approach. I’ve done several of her patterns and have always enjoyed the way she puts them together. 4. Spin Artiste LOVE this site for spinning inspiration! So much so that I am enrolled in her “Fibery Goodness” online course. Arlene highlights indie spinners front around the world and I am always filled with inspiration when I read those stories/interviews. 5. Fringe Association Another beautifully put together that celebrates the amazing possibilities with knitting. Great subject variety filled with inspirations and current knitting trends. Okay..one more! I just can’t help myself. 6. Knitted Bliss I love her “Modification Mondays” as well as her blending in snippets of real life to her posts. It feels very personal, genuine, and inspiring. 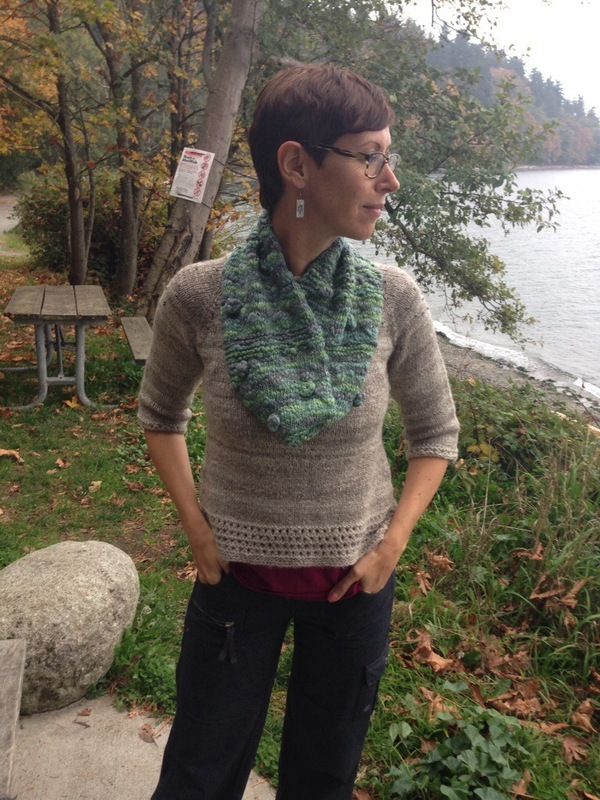 Great patterns too–a few have been on Knitty and her overall style is awesome. Wow–was a fun share out!! Your turn, and Spin On! This subject has been on my mind a lot recently. Most of us have the “essential things” that we have to do each day–work, family, etc. while those are often wonderful things, those actions can be very outward facing. When I think of people I know well, all of them have things they do that allow them to be more introspective and/or creative. 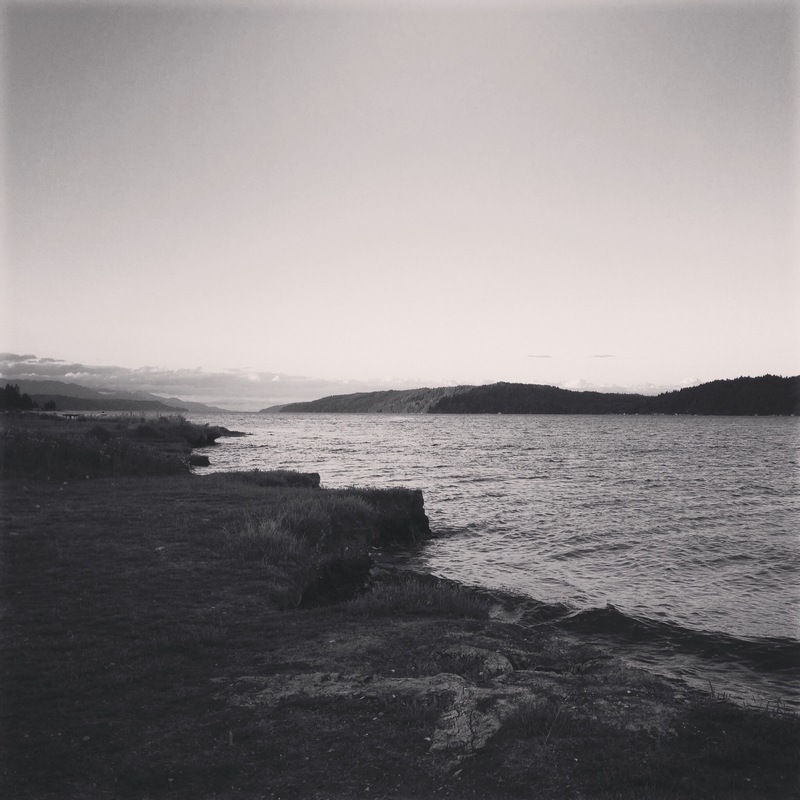 But how do we honor that space for ourselves within the busy routines of our day? The other day, a very close person in my life was overcoming a challenge to get to her space, her place to just “be.” I realized that even though my husband and I live in a pretty small condo, I have my place for reflection and creating in our guest room. But in my hurried moments, I allowed the space to become cluttered. The result of that was that I felt cluttered. I spent a few hours last weekend doing a big sort through and brought my space back to life. 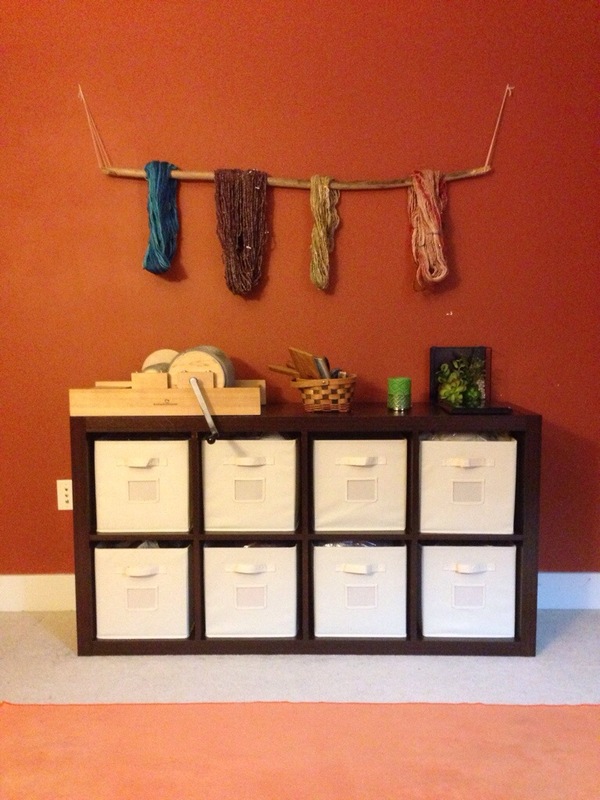 Freshly spun yarn hanging on the wall, organized shelves, and room for yoga without fear of falling on my drum carder and impairing myself. Sometimes seeing another person’s challenge and how it’s overcome can be the kick in the booty to look inward. Do you have a place that’s just “yours?” Away from TV, tasks, electronics, and responsibilities? How do you honor your own time..or us that something that’s still on your to-do list? Take it from my lesson. The time to step back is rewarding in ways that you don’t realize until you are there. Peace out and spin on! More soon, but here’s a few pix of my recent productivity. It’s the early dawn of Thanksgiving on the west coast, and I’m quietly having coffee and reflecting on all abundance of things I have to be thankful for in my life. I’m so grateful for my family, the fact that my mom is still with us despite her battle with two kinds of cancer. 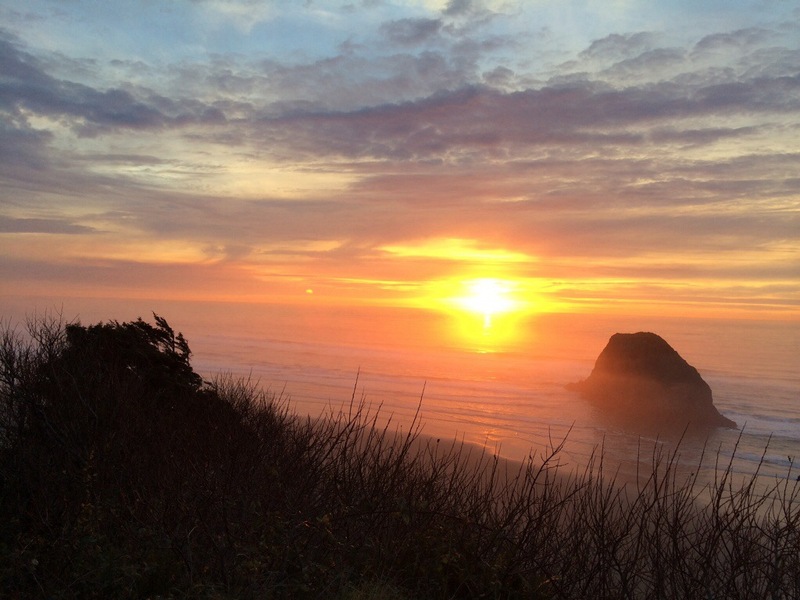 We’re all gathered at a house on the beach, and I just feel overwhelmed with gratitude–and it doesn’t take a holiday for me to feel like that, but that does give me a reason to write about it. But, I am also so grateful for all of you who read this blog. You are all around the world, from the US, to Canada, to Saudi Arabia, to Africa, to the UK, Europe, Australia, New Zealand…it’s crazy awesome!! You encourage and motivate me. I learn from you when I read your blogs. This spirit of companionship connected through art has changed me this year. You’ve given me the courage to start my etsy shop AND make it not-for-profit, which is a dream I had years ago–to celebrate art and use that passion to give back. It’s crazy, I know, but it’s GOOD crazy, and you are all a part of it. 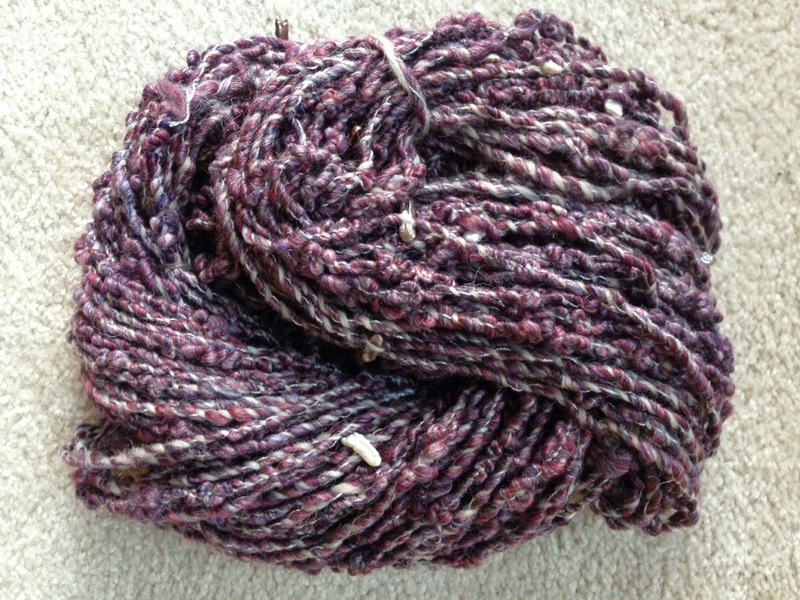 You are people who see handspun yarn like this with (pearly beads) and think of possibilities. Who stop by to comment on color or technique and give me ideas as to what to make with it. You inspire me with your own pictures/stories and how you spin, knit, or weave your life moments into your art. So, thank you. From the depths of my creative heart, I appreciate you all! 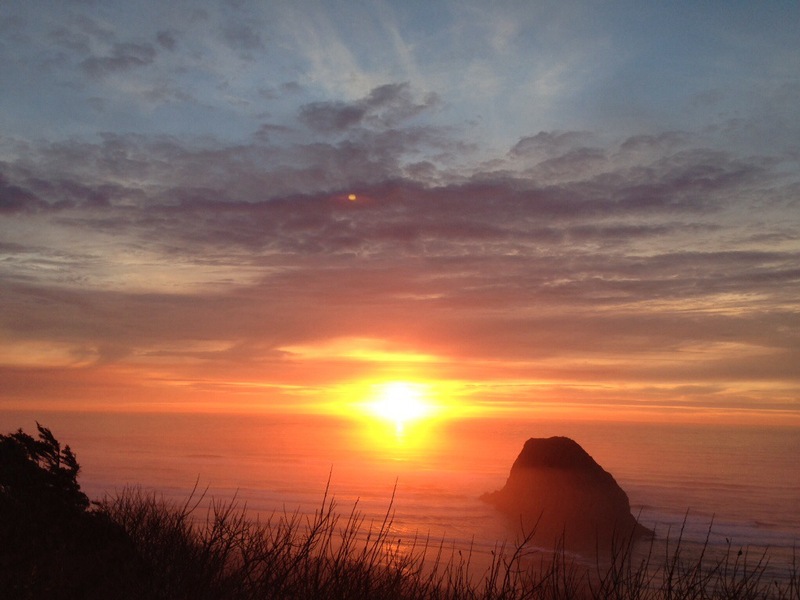 May your sunsets be as amazing as this one…Spin on! Spinning for the sake of spinning.. I love sitting at my wheel and filling a bobbin. Honestly, it is just as enjoyable if it’s a lace weight, art yarn, standard two ply worsted..there is just something really beautiful about a full bobbin of freshly spun yarn. In fact, one of the more difficult parts for me is deciding what technique to use for the final product. 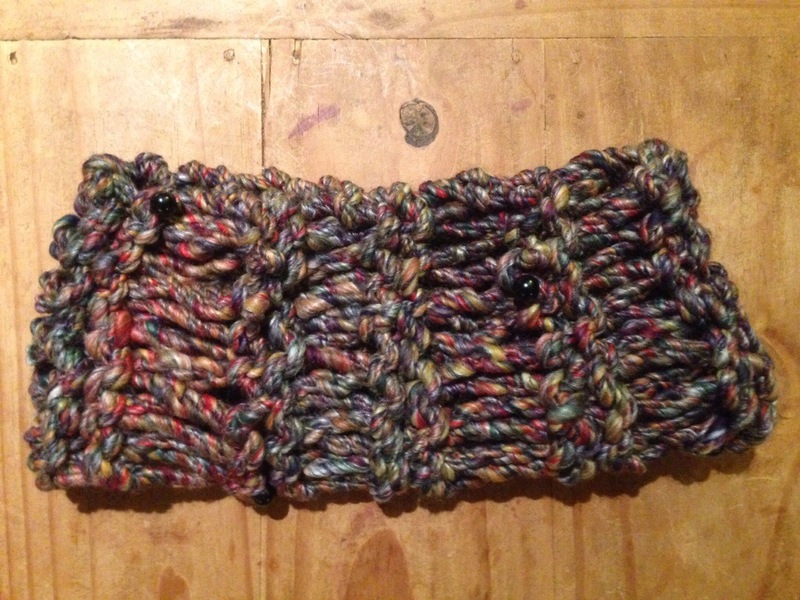 For the skein above, I was going to do supercoils..but at the last minute I decided it needed to be a Navajo ply. I wanted to spun a really even uber thick single, which requires a steady zen-like spinning technique..at least for me. I’m taking an online course to dig in deeper to art yarns, and the initial phase is all about exploring what types of yarn you like to spin the most. I’m having a hard time deciding because depends on what is inspiring me at the moment. How about you? 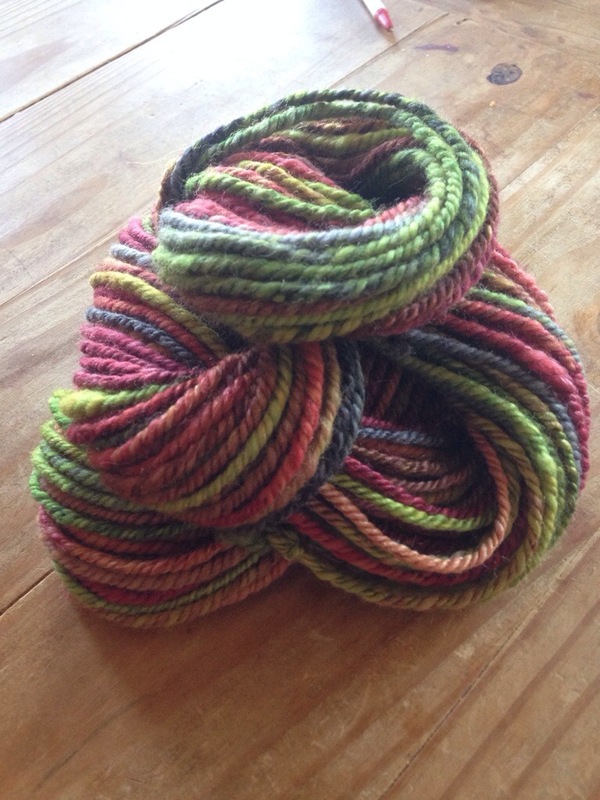 Do you spin for a purpose or for the yarn as the final outcome? 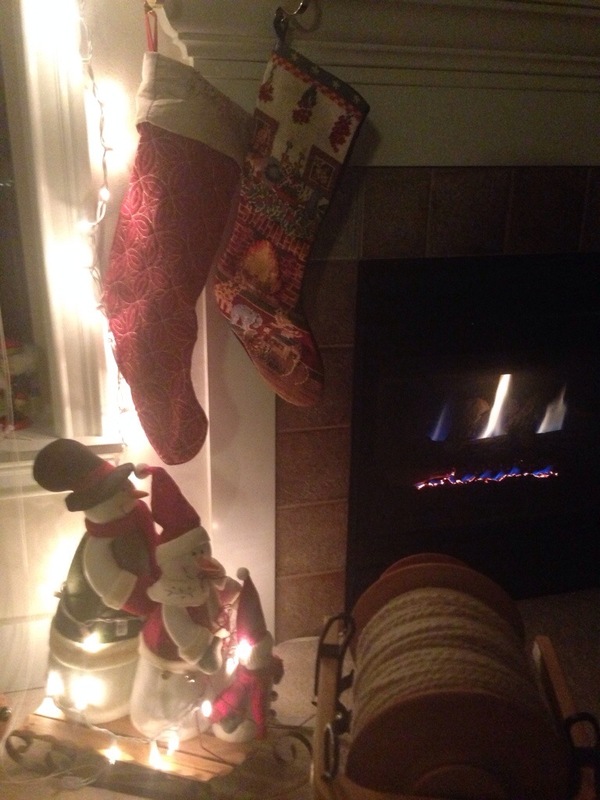 Oliver, spinning, weaving…so much going on! So…my blogging has been a little slow because of this sweet distraction. Can you blame me? Oh. My. Gosh. Meet Oliver, my new little sidekick. He’s 5, a rescue, and a mix of Shitzu and Maltese. 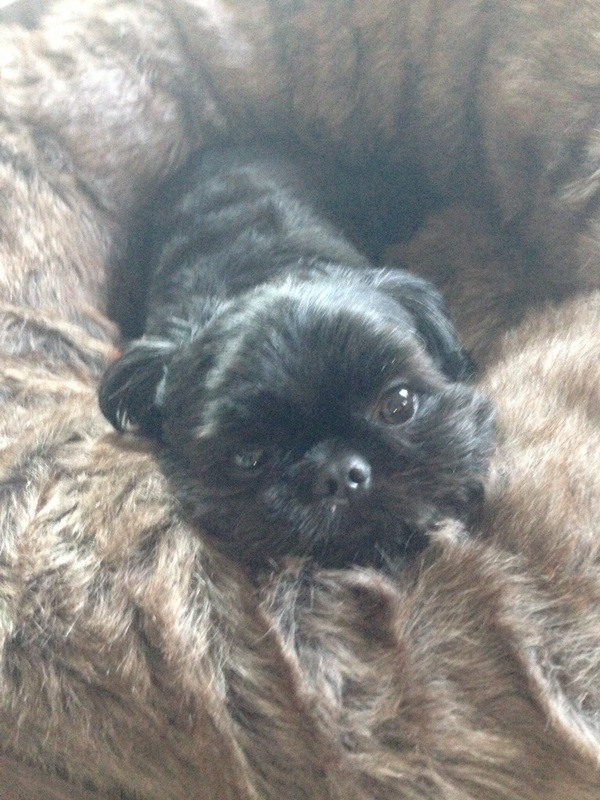 He’s like a cuddly teddy bear. I confess I have missed a few spinning evenings because he’s brand new to us and I couldn’t stop holding him! 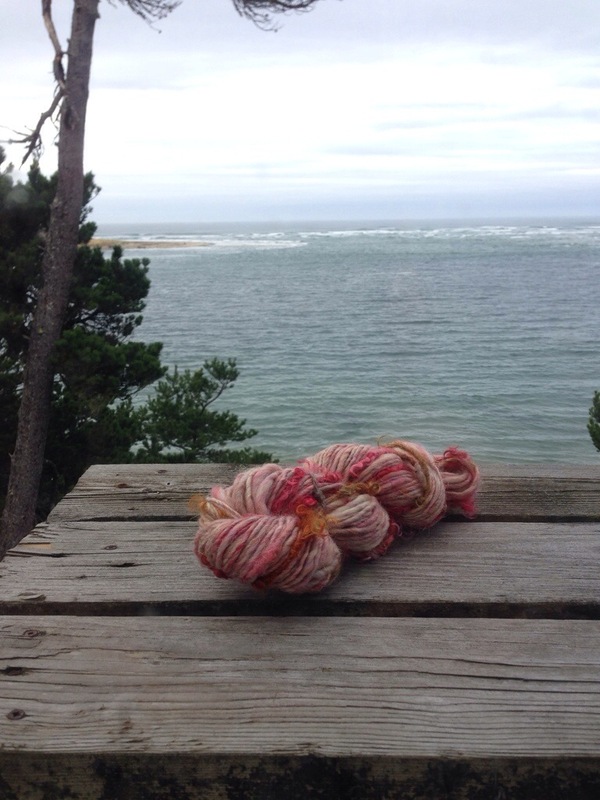 Stay tuned for more Ollie stories… But for now, back to spinning, knitting and weaving! Fall colors…and a cabled yarn. It’s a pretty simple technique and I love having the beads spun directly onto the yarn. 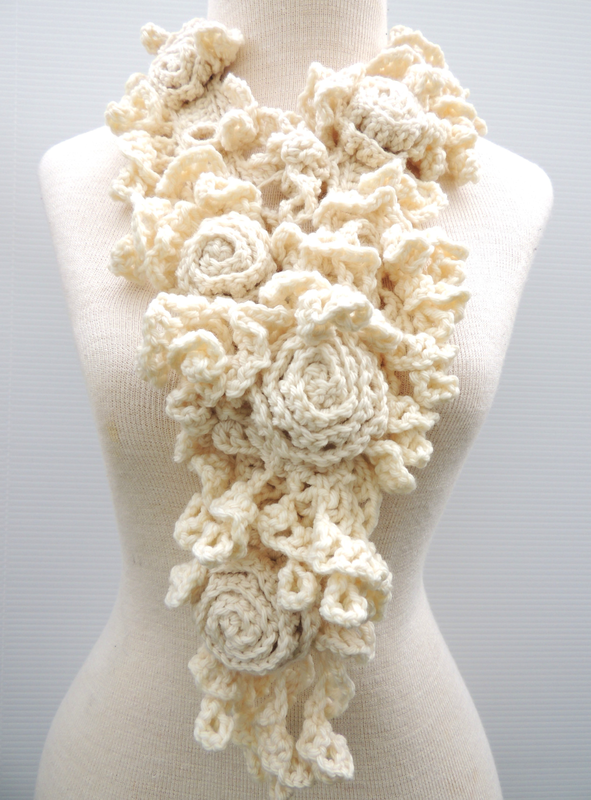 I’ll write up the pattern soon–it’s a very simple cowl that makes a sweet neck warmer–and with the beads, who needs a necklace? 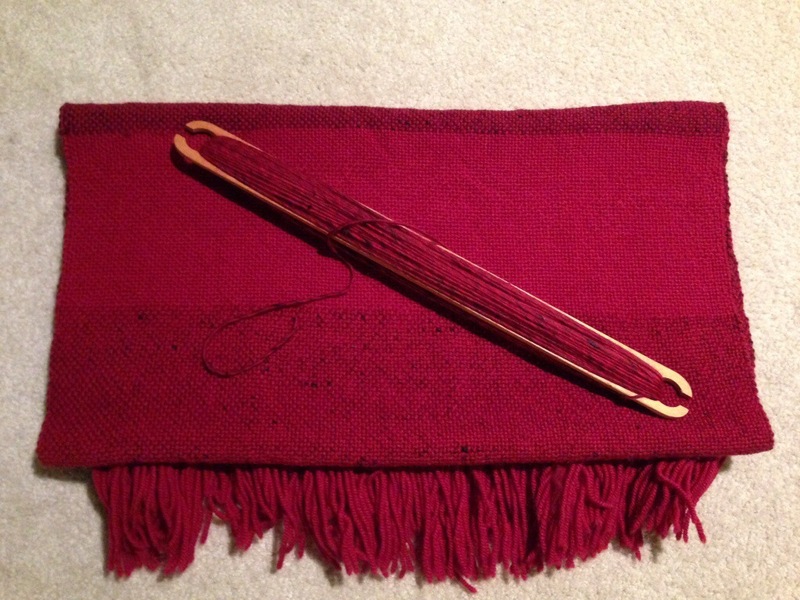 My other big project was a shawl I wove for my mom..she requested one large enough to wrap around while sitting on the sofa watching a movie or reading, but not a bulky as a blanket. I think she’ll enjoy it! 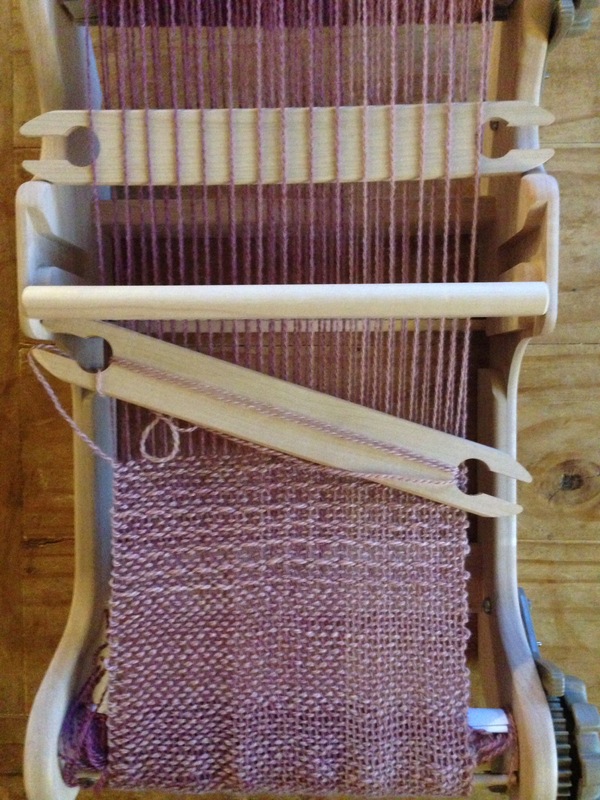 I do love weaving..it’s such a different stride from spinning and knitting. I just have to get over the whole warping thing..not my favorite part! But still..a fun project! Spin on!! First report from my “pay it forward” Etsy shop! I have a custom order in progress for November..and it’s so exciting to see this little dream come to life. The joy in all of this for me is the ability to create art from nature. Knowing that someone is wearing and enjoying it and that the proceeds are going to an organization that I truly believe in makes the whole thing come full circle. 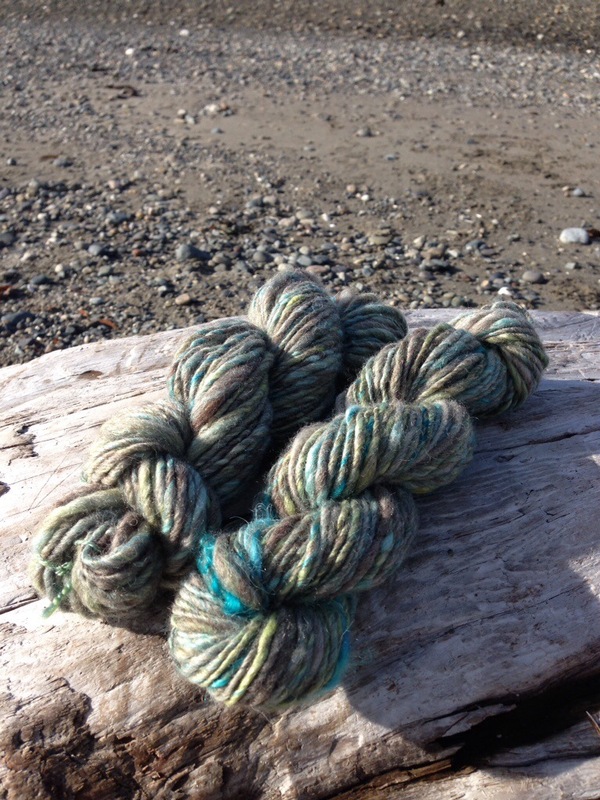 In other bloggy news..I just signed up for an online class to learn new techniques for spinning art yarn. It starts in a week, and I can’t wait to get going on it! I promise to post progress pix..even the ones that are kinda crazy! This is one of the first items to be sold for November, my Sea Glass Yarn, so I already know I’ll have an update for you at the end of the month!